As followers of the Antique Dealer blog will be aware, one aspect of the continued development of the Antique Dealer research project has been an investigation into the emergence and role of themed exhibitions staged by antique dealers over the course of the 20th century. Indeed, as a platform for dissemination of information on antiques and as a mechanism for the marketing of antiques, these exhibitions very usefully draw attention to the deep synergies between structures of knowledge and the art market. Dealers have regularly organised selling exhibitions of course – the famous ‘Summer Exhibitions’ held by the leading New Bond Street dealership Frank Partridge & Sons from the 1950s to the 1980s, were opportunities to showcase new stock and for the swish private preview parties for the exhibitions, which were significant events in the social calendar. Such exhibitions were attended by the most influential collectors, museum curators, interior decorators and antique dealers. But what is of particular interest to the research project are the more scholarly, thematic exhibitions that antique dealers have staged over the years. These exhibitions, which remain a regular part of the current practices of antique dealing at the top of the antique trade, demonstrate the discrete, focused and scholarly contributions that many antique dealers have made to the knowledge of antiques – such exhibitions have often been accompanied by museum-type catalogues composed by antique dealers who are acknowledged as leading specialists in their field. We are very fortunate that in the recent additions to the Phillips of Hitchin archive (again very generously sent up to us in Leeds by Jerome Phillips, who found the extra material whilst tidying up some stores – thank you again Jerome!) we now have a range of material that illustrates the detailed planning and execution of a range of ground-breaking exhibitions held by Phillips of Hitchin during the 1970s and 1980s. Jerome organised these immensely influential selling exhibitions on specific furniture types – a model, unsurprisingly, that was also being adopted in public museums such as Temple Newsam in Leeds at the time (see, for example the exhibitions on ‘School Furniture’ organised by the furniture history scholar Christopher Gilbert at Temple Newsam in 1978 and a similar exhibition at Temple Newsam on ‘Common Furniture’ in 1982). The Phillips of Hitchin exhibitions in June 1981 and June 1984 (staged to coincide with the Grosvenor House Antiques Fair held each June (except 1981) in London) are key examples of these types of antique dealer exhibitions. 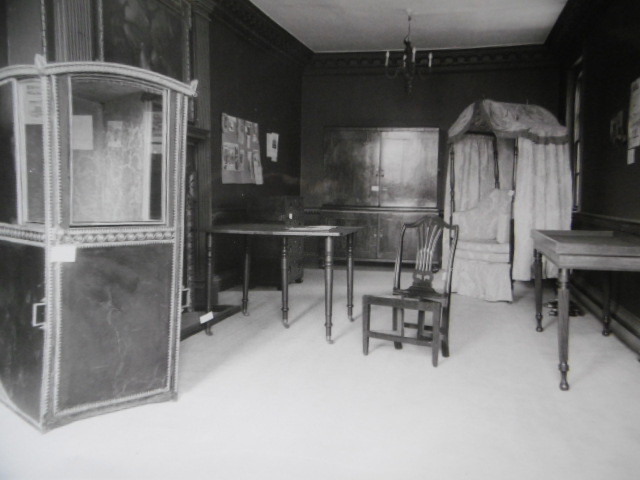 In 1981 the exhibition on ‘Dining Room Furniture 1730-1830’ was a scholarly project, with antique furniture placed in rooms to mirror the social use of the objects at the time they were made – rather like a ‘period room’ setting that was also so popular in museums at the time. 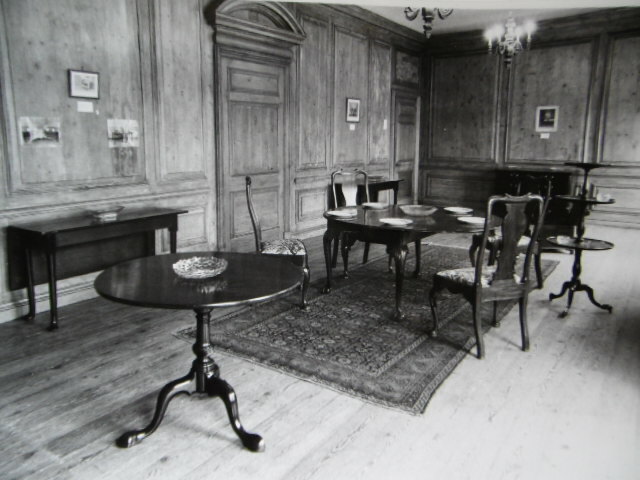 Phillips of Hitchin exhibition ‘Dining Room Furniture 1730-1830’ June 1981. Photograph Phillips of Hitchin archives, Brotherton Library Special Collections, University of Leeds. Here’s another room at The Manor House, Phillips of Hitchin’s shop, with the assembly of some furniture suggestive of a more rustic dining space. The exhibition had a fully illustrated catalogue – Jerome remains a leading scholar on antique furniture and wrote many essays on the subject that appeared in publications such as Antique Collector; it’s also worth mentioning that in 1978 Jerome composed the new Introduction to the reprint of R.W. Symonds Masterpieces of English Furniture and Clocks (first published in 1940). Phillips of Hitchin exhibition ‘Dining Room Furniture 1730-1830’ June 1981. Photograph, Phillips of Hitchin archives, Brotherton Library Special Collections, University of Leeds. 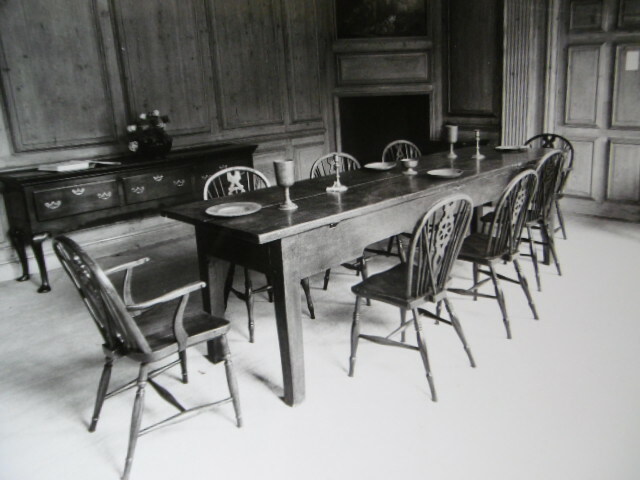 Phillips of Hitchin’s exhibitions on dining furniture might be considered as relatively conventional, and of course they were more than just museum-type scholarly projects and also offered the opportunity for potential buyers to imagine new schemes for their dining rooms. Jerome’s next exhibition, in June 1984, was of a type that was more ground-breaking, for the antique trade at least (as I mentioned, museums such as Temple Newsam were already organising exhibitions focused on specialist furniture types in the 1970s). 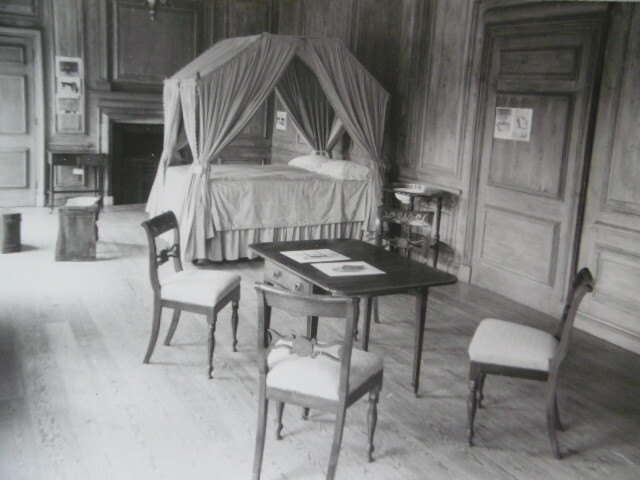 The ‘Travelling and Campaigning Furniture 1790-1850’ exhibition in 1984 involved considerable primary research and was again accompanied by a catalogue with a discursive essay on the historical development of travelling and campaigning furniture. Phillips of Hitchin catalogue for Exhibition of Travelling and Campaigning Furniture 1790-1850. The Travelling and Campaigning Furniture exhibition was obviously more specialist in nature, as I imagine was the audience for the exhibition – specialist collectors of ‘metamorphic’ furniture and museum curators perhaps? But the exhibition itself was a considerable success, according to the detail in the Phillips of Hitchin archives on the exhibition. Indeed, reading the archive one cannot but admire the research and the time and effort that went into the planning and delivery of these exhibitions. 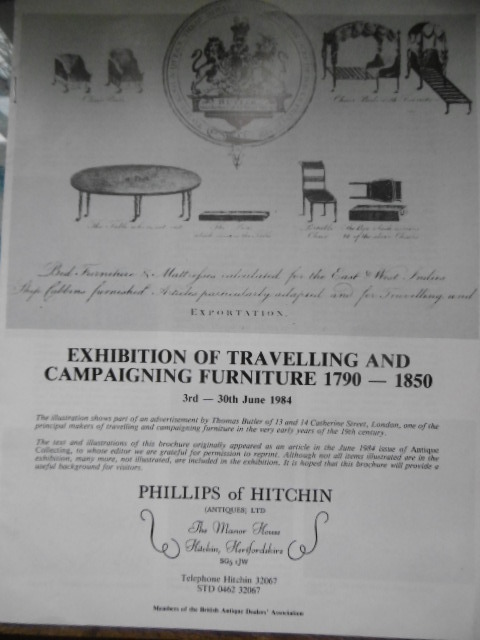 Phillips of Hitchin exhibition ‘Travelling and Campaigning Furniture 1790-1850’ June 1984. Photograph, Phillips of Hitchin archive, Brotherton Library Special Collections, University of Leeds. The new parts of the Phillips of Hitchin archive contains numerous photographs of the actual exhibitions, together with correspondence and supplementary detail on the planning of the exhibitions themselves – it’s a wealth of material that helps us to understand the objectives and complex nature of these scholarly and selling events. One further thing, and something that also demonstrates the richness of the archives that Jerome so generously donated to Leeds University, is that Jerome also saved the object labels from the exhibition! …..and here’s just one of a number of those labels from an object from the ‘Travelling and Campaigning Furniture 1790-1850’ exhibition. 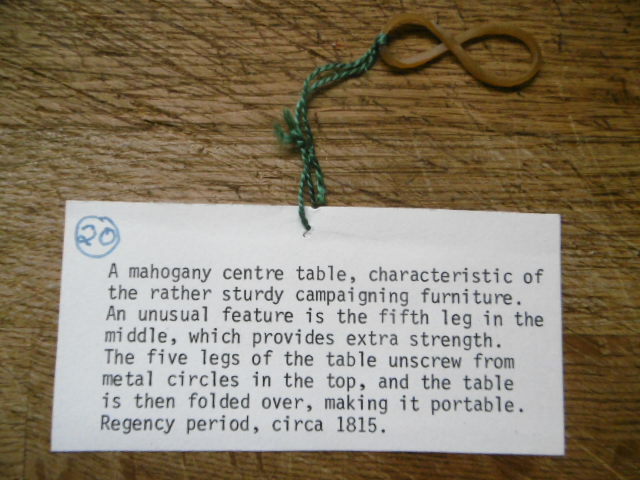 Phillips of Hitchin exhibition ‘Travelling and Campaigning Furniture 1790-1850’ June 1984, object label. Phillips of Hitchin archive, Brotherton Library Special Collections, University of Leeds. There’s more to say about the significance of these scholarly selling exhibitions organised by dealers such as Phillips of Hitchin and we are fortunate to have such archive material to help us to continue to explore and analyse the cultural history of the British antique trade.